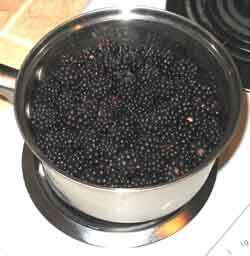 We've had a bumper crop of wild blackberries this year, so Bob has been busy in the kitchen. 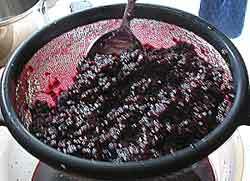 First we picked, soaked (to get out the creepy-crawlies), washed, and drained about 6 cups of blackberries. Put into a 2-quart saucepan. Add enough water to cover the bottom so they won't burn or stick--about 3 tablespoons. Add 1 cup of white sugar and 1 cup of brown sugar. (Experiment with less sugar if you're dieting.) Mix together. Bring to a boil and reduce heat until just bubbling. Watch and stir occasionally. Cook until mushy--about 7 minutes. Add 1/2 teaspoon vanilla if desired. Remove from heat. Cover and cool. Pour into fine strainer to remove seeds. Stir the mixture down, gentlry,to get out the syrup. Don't push it through the strainer. Blackberry seeds are very small and you want the syrup pure and free of seeds. Stir until it stops dripping. Yields about 3 1/2 cups of thin syrup. Pour into clean containers and refrigerate. Excellent in hot or iced tea, poured over icecream, as a mixer in lemon-lime sodas, and added to canned fruit. 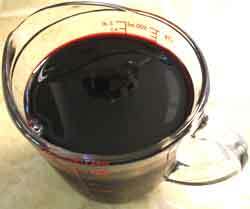 What's left after straining is a pulpy mixure, about the consistency of preserves. Outstanding on toast! We've also used it to make pancakes, cobbler, and muffins. For a real treat, make blackberries pancakes and serve with this mixture as a filling. Top with powdered sugar and drip the syrup over the top. HINT: Put leftover pancakes in the toaster oven to make the edges crunchy. This entire process can be modified to suit your tastes. We like the thin syrup, but if you want it thicker, you could experiment with cornstarch.